Ac Milan captain Massimo Ambrosini has already spend 16 years of his playing career with the Rossoneri and seeing that strong attachment he had with the club, the midfielder confirm that he has no intention of wearing another Serie A clubs aside from the Red and Black in the future. With his current contract reportedly will end in 2011, should he fails to negotiate new deal with Milan, Ambro stated to the media that he would rather move abroad instead. “It would be difficult for me to wear another shirt in Italy. 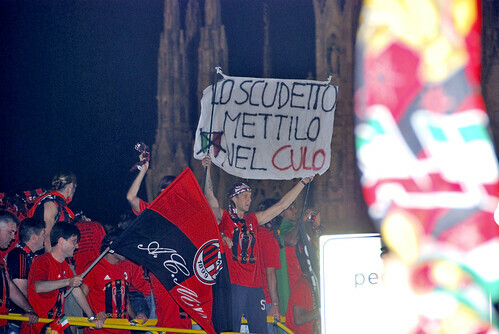 But I have no intention of stopping, so if I weren’t to find an agreement with Milan, I would go abroad,” Ambrosini said. So far after returning from an injury that he picked up early in the season, Ambrosini has been performing constantly well becoming a new defensive anchor in Milan’s re-shaped midfield this season. The skipper replaced the role of Andrea Pirlo, who has now been moved forther up into the field by Massimiliano Allegri considering that Ambro is a much more stronger player in playing the defensive role in front of the defender. Witnessing the captain’s fine performance so far it would probably difficult not to see his contrach isn’t being extended for at least another year, however everything will surely be decided in the end of the season as the club’s management seemed content to see the results of this current season before deciding anything. However, with Milan’s seemingly rejuvination plan next season, there’s always a chance that they could let go Ambrosini considering his contract will end next summer and he can’t really considered as a young player anymore. Still considering Milan’s recent past in treating their legends, should Ambrosini can still perform well in a regular basis this season than there’s probably no stopping him in couninuing his career at San Siro for at least another year. The captain has undoubtly become one of the example of a player who gets better when he’s older as his performance in his latest years are much more convincing compared to his earlier younger days. So as the Rossoneri’s tifosi are waiting anxiously until the end of the season on how would their team do, the team’s captain will probably be as anxious as them about his future career in the red and black shirt.